Everyone agrees that pet flea control and flea pest control in general are extremely difficult. Flea containment is probably the biggest single reason for this. Removal and flea treatment must go hand and hand for successful control; but even this is not always an easy nor a pleasant task and often seems highly difficult and hopeless. Many people just give up to later find that this simply is not an option. Make sure you follow these steps closely. Click on the links below for specific instructions on what to do. Understand that it will take weeks not days before they are completely gone. The reason for this is that although Atomic can kill the existing fleas and completely remove them along with the eggs and larvae. Other pest control services will not remove these which will in turn take about 2 weeks to hatch and then you will see fleas again. Don't panic.. It's very hard to estimate the types of fleas around, but the number is usually around 2,500 species of fleas all over the world. About 325 of which live in the continental United States and over 94 percent of these can be associated with mammals, while only 6 percent live on birds. At the very least 30 species are believed to have been found on mammals, but the cat flea and the dog flea are definitely the most serious problem throughout the country. Without a doubt this awful pest is a very serious pest for livestock, pets, and humans. So, you are probably dealing with either the dog or cat flea. 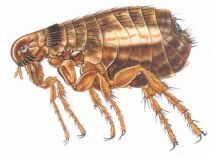 These fleas are constantly laying down eggs everywhere they are "carried", your pet is the host or carrier, and within a few days you have a horrible flea infestation. 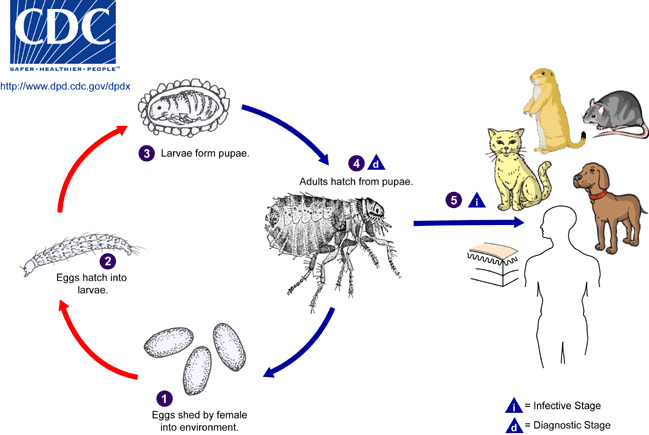 The basic idea is to have flea control products (natural ones if you are living in the home) already in place so when they hatch you prevent them from laying down more eggs and killing fleas at the same time. Fleas are wingless insects averaging 1/12-1/8 inches long, oval and reddish to brown in color. Wingless with thin bodies (so very thin that they are able to move freely through the fur or/and feathers of their hosts) and long legs which allow them to jump an average of 7-8 inches vertically and 14-16 inches horizontally. A beak which extends forward when the flea bites to take a blood meal. They are common pests to humans and animals around the world, although most prefer non-human hosts. Most common flea encountered in the United States can be narrowed down to the cat flea and the dog flea which are found on wild animals, rarely on domestic animals. Click on a kind of flea below for treatment and control.